Over the past few years biodegradable pots have become increasingly popular with nurseries and gardeners alike. There are several reasons for their popularity. One is that the roots of the plants to be transplanted are not damaged during transplanting. Another is ease of use, all the gardener has to do is to dig a hole slightly larger than the pot, place the pot in the ground, and let nature take care of the rest. The most important reason that bio-pots are so popular though, at least in my humble opinion, is that they keep thousands of tons of plastic out of the landfills and return to the earth that which was taken from the earth making gardening a much more sustainable endeavor. Bio-pots can be composed of many biodegradable materials the most common being, peat moss, coir fiber made from coconut husks, and yes, believe it or not, composted cow manure which are called, of all things, cow pots . Bio-pots have come along way from the bland gray containers from yesterday. There are now colored pots available from a variety of companies that are made from grain fibers and bear a remarkable resemblance to the popular clay and plastic pots. These pots look great in any windowsill and even better, they won’t clog up any landfills once they’ve outworn their welcome. In my opinion, one of the best features of the internet and more specifically, social networking is that it allows us to communicate with people from other countries and learn about their culture. I have always had a curiosity for tropical foods. As a child I remember learning about papayas while watching a film about the people of the tropics in elementary school. Unfortunately I never tasted one until I was well into adulthood. 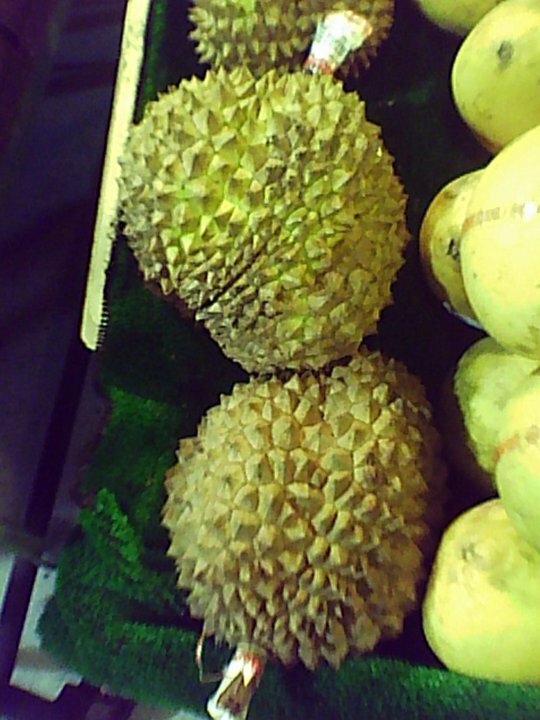 Well, thanks to my facebook and twitter friend, Sunshine Abarquez Maxilom has been kind enough to share some pictures of some of the fruits and vegetables found at her local market. Thank you very much Sunshine! The first is Durian which looks like a porcupine and supposedly tastes like almond-custard and smells like a cross between dirty socks and rotten onions which doesn’t sound too appealing but I am told they are really quite good and you can even eat the seeds; Shineshine tells me they are quite tasty. Durian has the distinct reputation as being the King of Fruits, it also has a reputation for being banned from some hotels because of its strong odor which brings a question, “ If a hotel is to good for a King, who can stay there?” Durian grown on trees and can grow up to 6 inches in diameter and 12 inches long weighing 3-7 pounds which means this is one tree you wouldn’t want to stand under. Next is the Gabi which is Tagalong for taro root. The Gabi, for all practical purposes is the equivalent of the potato in Polynesia. The majority of the Gabi plant is edible including the elephant-ear-like leaves. 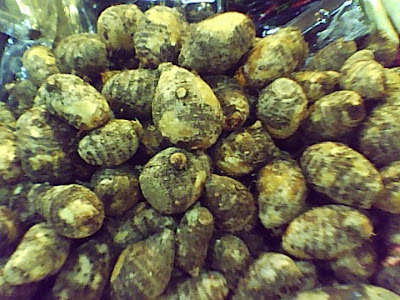 The root of the Gabi is starchy and sweet an is eaten as a vegetable or a treat. Looking for a natural born cancer killer, the guavano or guyabano fruit has been touted as being more effective than chemotherapy for treating cancer. Long know for having many homeopathic uses, the guavano fruit is being studied by medical institutes, universities, and pharmaceutical companies for it’s ability to fight a vast array of illnesses. Guavano is a sweet tasting fruit with a tough spiked skin. It typically grows from 6-8 inches long and weighs about 5 lbs. Inside it is filled with a creamy flesh and hundreds of seeds that are not edible which reminds me of a pomegranate which also has many healing properties. It seems like there is a connection between seedy fruits and hollistic properties which might be a great topic for another blog. In the Philippines a sweet potato is called kamote and virtually the entire plant can be eaten. Kamote is typically boiled and is eaten with fish. It is much more nutritious than regular potatoes and is a rich source of Vitamin A ,B,and C as well a iron, calcium, and phosphorus. It’s been said that “good things come in small packages.” And evidence of this is a wonderful little orange called Kiat-kiat. 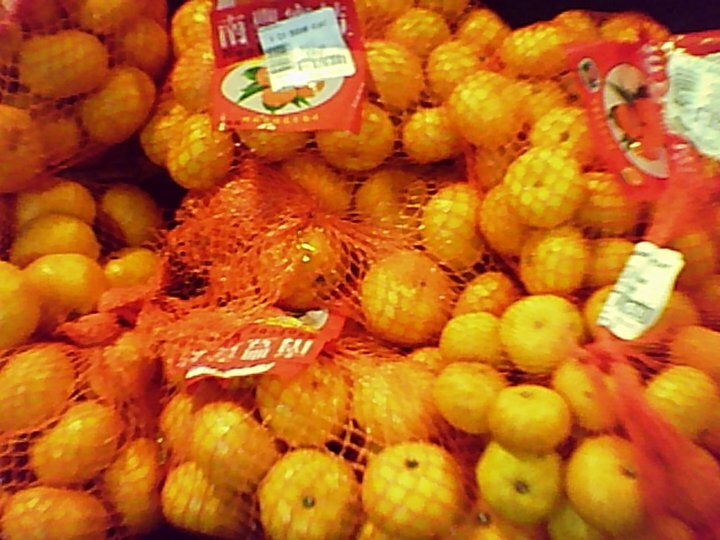 Kiat-kiats are sweet, easy to peel, and abundant in the Philippines making them an inexpensive and delicious snack. They are also good peeled and added to salads. Kiat-kiats are a variety of Mandarin-Oranges which are those perfect little canned beauties that go so well with orange jello. Because kiat-kiats are easy to transport it is not uncommon to see them in the produce section of many super-markets in the U.S.
Have you ever eaten a sponge? Patola, a common vegetable in the Philippines, when dried becomes stiff and porous and is often used as a bath brush. 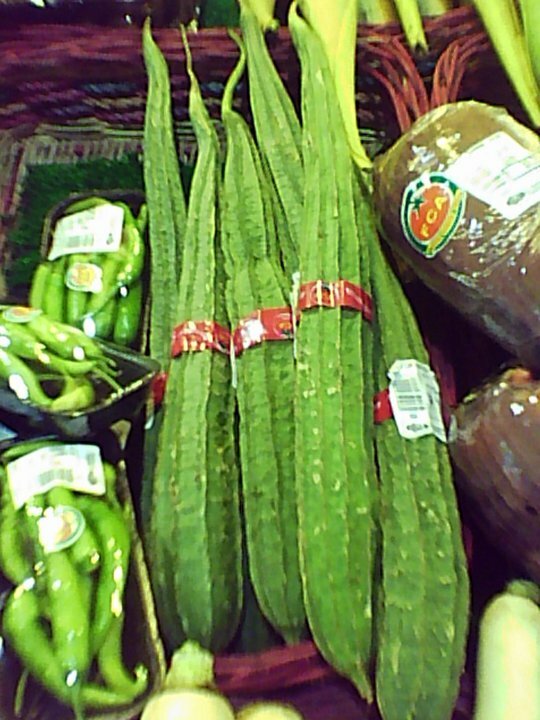 Patola grows on a vine like a cucumber and looks like a cactus. It is prepared and eaten by cooking or frying and is used frequently in soups and salads. Patola is a rich source of calcium, iron, and phosphorus. 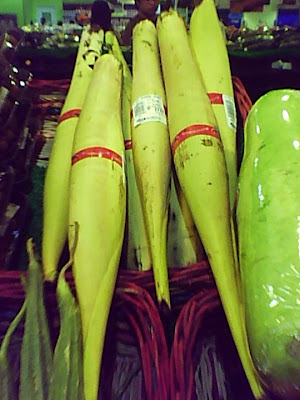 ﻿﻿While many of us have eaten bananas, in the Philippines they eat the heart of banana or Puso ng saging as it is called there; they are actually banana blossoms. Guinataang Puso ng Saging or banana blossom cooked in coconut milk is a popular dish in the Philippines. 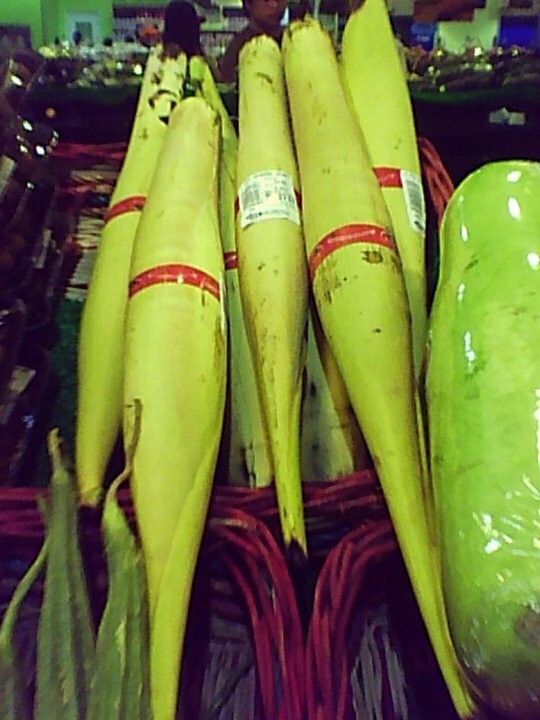 Puso ng saging are also available in many Asian Markets in the US. 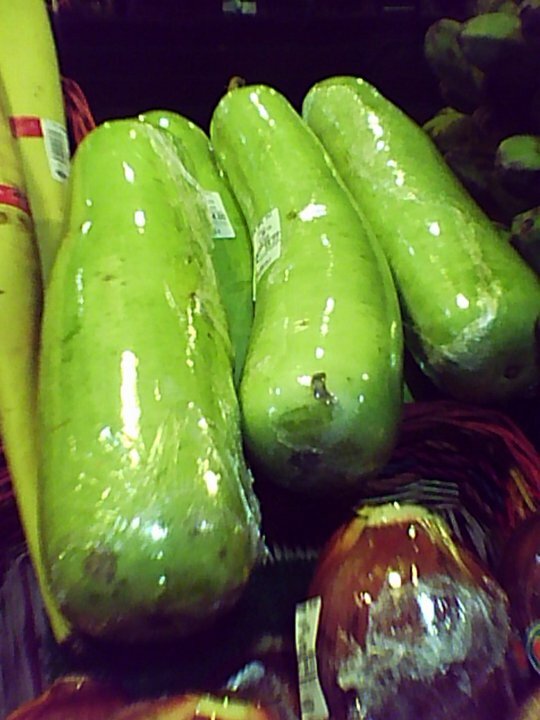 Not to be mistaken for the popular card game Uno, The vegetable Upo is a huge gourd that often grows into odd shapes. Upo, eaten only before it is ripe, hardens when ripened and can be used for such items as handbags and water jugs. Upo is also know as winter melon because it is easily preserved and is often eaten in the winter in such countries as China and Korea. 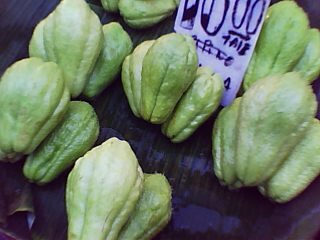 ﻿Another vegetable common in the Philipines is called sayote and yes, it is also called chayoti in Central America. Sayote is a member of the gourd/squash family and is often lightly cooked or served raw with salads. While it does not have much flavor, it is a very good source of amino acids and vitamin C. See also my post on The Exotic Fruits and Vegetables of Costa Rica. 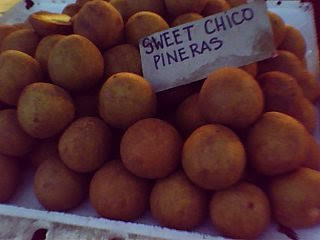 Our next fruit, Sweet Chico Pineras, look almost like brown eggs. I have not been able to learn much about them other than and people either love or hate them. Last on our list is malunggay often referred to as the poor man’s vegetable it is now know as a miracle food because it contains many vitamins that are beneficial to health and actually can be used as a remedy for many illnesses. Malunggay are neither a fruit or vegetable but an edible leave of a tree that just happens to be a fabulous nutritional supplement. Once again I would like to thank ShineShine for taking the time to share these photos with us, it’s been a real treat. Just for the record, ShineShine is also a singer/guitarist, photographer and all-around talented person and without a doubt a rising star. I hope you have enjoyed reading about these exotic fruits and vegetables as much as I have enjoyed writing about and learning about them. I look forward to visiting many more markets around the world either in person or via then internet, but most of all, I enjoy sharing them with you. Its a Miracle, The Food Safety Bill Passes in Record Time! How can a bill that has a 95% opposition rate in the polls pass into law? What amazes me most is that only a few days ago the S 510 bill was dead on the capital floor. Now, as if by some miracle it has passed both the house and senate and is expected to be quickly signed by the president. It is just absolutely amazing how quickly a special interest bill can pass while a bill that actually helps the American public can take forever to be passed into law. Well I have to hand it to the lobbyists, they pulled off a miracle and I hope everyone will want to thank them for higher food prices. Fortunately, Senator Jon Tester D-Montana added an amendment to the bill that protects small growers who sell withing a 275 mile radius from the bulk of the regulations, but they will still have to have to identify hazards (whatever they are), and implement preventive measures which typically translates into one thing, higher costs for both the producer and the consumer. Oh well, what else is new. I will pass on more information as I learn about it and how this will effect the consumer and our Farmer's Market's, in the meantime, please continue to support your local growers and businesses and please continue to be a pain in your congressman's rear-end! Until the next time. Happy gardening! Hurray! I love passing along good news and today I am happy to announce that the Food Safety Modernization Act is about to Die in Congress because of a technicality.....Yeah for technicalities!! What has led to its demise is a law that states it must originate in the House if it is a revenue raising bill; it started in the Senate and then passed in both houses with overwhelming support. Well, leave it to our politicians botch things but gratefully this time it works out in the people's favor. The democrats tried to attach a mega-spending bill to it on its second time through and it was crushed. I just like to think that angels intervened on our behalf. While this is a great victory for the American people, it is by no means over; someone is sure to draft another bill. There is no question that the United States need to protect is food supply, since when did it become a big problem. I mean, e-coli and salmonella have been around for years and quite frankly there is no simple way to detect the presence of these and other food-borne germs. Senator Tom Coborn R-Okalhoma opposes the bill and states in a CNN Politics Article that, "it spends billions and increases government regulations without actually making the food supply safer." What it would do though if it were to pass is to regulate small growers, farmers markets, and small producers to the point that it would be unprofitable for them to stay in business. Add to this the phenomenal cost of trying to enforce and comply with these regulations and it is clear that the ones to absorb those costs will be the American people; we cannot afford to let this happen. Therefore, I have appointed myself a watchdog for any other activity regarding food safety and I pledge to be a thorn is the side of any corporation or politician that trys to sneak through special interest legislation regarding food safety that does nothing for the citizens of the United States other that raise costs and eliminate the competition for the Mega Corporations. I love being able to have the freedom to buy food directly from the grower, and I love the entrepreneurial spirit that is coursing through the veins of the American people right now and I am not about to stand idly by and watch our government extinguish that fire. It has just occurred to me that I haven’t done an update post on my container garden but I’m here to say things are looking mighty fine. The weather has been in the 70s during the day with plenty of sunshine and the low 50s at night so the weather is great for the garden. We did have a couple of nights the other week that dipped down to near freezing, but with a container garden it is easy to avoid frost damage; all I had to do was move them indoors. The Heritage Tomatoes I planted are doing fantastic. All of the research I have done says that Heritage Tomatoes produce less fruit that hybrids but if my little garden is any indication of this, the facts are totally wrong. The heritage I put out early now has about 15 tomatoes on it with more about to appear. The real challenge with this is making sure it has enough water. I use a 3 gallon self-watering pot to plant my first heritage but next year I am using a five gallon. The 3 gallon doesn’t allow the plant to get a large enough root system to support itself. This means that if I want to get large fruits I will need to prune off some of the unproductive branches. This will assure that the fruit gets enough moisture to reach its full size. I do need to be careful not to prune the plant back too much or it will not produce enough sugar to fill out the fruits and it may even die. I will be doing another post very soon on pruning tomatoes as it is very important. As far as my hybrid tomatoes, there are plenty of flowers but so far only one fruit. My Anaheim Pepper plant has four fruits each about half way to full size. I think that I would have gotten a better yield had I planted it in a larger pot to begin with as it is now finished blooming. Just a note, this is my first real attempt at a container garden so I am really learning much about the importance of container size selection; the next crop will be much more successful. ﻿The Jalapeño Pepper has several fruits and again I used two small of a container, I should have used a one gallon instead of a half gallon. This will hold true for all of my peppers. The red peppers were kept in the original pot too long before transplanting so they are way behind the others and are not even flowering yet. There has only been one casualty in the garden; my Sweet Basil Plant withered and died when I put it out in the Sun. Last week when I was down at the market I ran this by Doug of the Herb Guys. He told me it was an acclimation problem common with plants bought at large garden centers. I will be posting a solution to this in an upcoming blog as well as an introduction to the Herb Guys and the wonderful services they provide to local gardeners. Hello All, I just want to use this post to get this word out that my friend Kathleen Ames will be having a Cookbook Signing in Phoenix Arizona. Kathleen has put together an incredible cookbook that is destined to be a Kitchen Classic. As stated in my previous blog post, this Cookbook is unique in that it was written by local chefs, growers, vendors, and processors with an emphasis on buying local. Most of the recipes in this cookbook can be made using ingredients found at the local Farmers Markets. Don't miss this chance to support local permaculture and to get a signed copy of one of the best and most unique cookbooks to hit the market. There will also be a second signing at a date to be announced later. I will keep everyone posted. The first of the Cookbook Signing Event will be this Thursday, Dec.9,2010 from 11am to 2pm. at the Borders Bookstore at 24th St and Camelback Rd in Phoenix,AZ. The store is in the mall next to The Cheesecake Factory. If you don't live in the Phoenix area, and you still want to get a copy of her book, you can visit her website: http://www.thefarmersmarketcookbook.com/ ; its well worth the price. I rarely get this excited about a cookbook but this is a must have for every kitchen and I hope to try many of the recipes myself. I will try and get pictures of the event to share on my next blog. I wish I could say I thought of it first, but I didn't; thankfully Kathleen Ames did! Kathleen has created a fabulous cookbook titled The Farmers Market Cookbook and the current edition is the Valley of the Sun Edition. The unique feature about Kathleen’s cookbook it that it is tailor-made to use ingredients that support local producers and vendors. One of things I enjoy most about going to a Farmers Market is all of the wonderfully creative people I meet. I originally stopped by Kathleen’s booth at Old Town Scottsdale Farmers Market because I saw that she had call to action flyers regarding Senate Bill 510. I discovered that Kathleen is also very passionate about open markets, and like myself, hopes to be able to visit markets all over the world. Kathleen is very enthusiastic about supporting Farmer’s Markets and has published a marvelous cookbook as testimony to this passion. ﻿﻿﻿﻿ ﻿Kathleen Ames’s Cookbook is a wonderful, well-written collection of recipes contributed by local chefs, farmers, vendor’s and market supporters. If you enjoy gourmet cooking then you won’t want to miss this cookbook. There are over 300 recipes; everything from avocado rolls to zucchini bread. For those into healthy drinks, there is even a recipe for apple grass juice, and it looks delightful! Recipes are not all that can be found in Kathleen’s cookbook. There are many helpful ideas including meal planning tips, a list for keeping a well-stocked pantry, baking tips and hints, and measurement conversion tables. Among the many helpful items in the appendix is a calorie counting table and a glossary of cooking terms. Also included with the cookbook is a CD containing a list of many vendors and supporters of Arizona’s Farmer’s Markets and three pages of vendor coupons that can be used at the markets. Right now there are only a couple of ways to get a copy of this fantastic cookbook! One is to order it on Kathleen’s website: http://www.thefarmersmarketcookbook.com/ , the other is to visit Kathleen’s booth at one of several markets listed the cookbook page on her website. Word also has it that her book will soon be available at Borders, and she will be having a couple of signing events in the near future; I will keep you posted as to times and locations. Of The Sun Farmer's Market Cookbook. For those of you who are looking for great recipes using fresh, high-quality ingredients, this cookbook is a must have item for your kitchen. The cost of the book is $14.95 + tax at the markets. Add $5.00 shipping and handling for online orders. Either way this cookbook is a bargain! I plan on buying several more copies to pass on as gifts and to use mine as a weekly meal planner and shopping guide. I look forward to hearing more from Kathleen in the future. Until the next time, Happy Gardening.